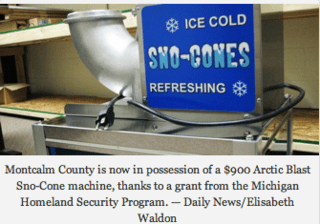 When I mentioned the other day that Michigan now has a set of 13 snow-cone machines that it bought with homeland-security grant money, I prefaced that by saying that everytime you think "homeland security" can't get more ridiculous, it gets more ridiculous. Even that story got more ridiculous. The machines do look nearly identical, but in fact I think these are two different models of dual-use anti-terror/refreshment machines. First, of course, this is the "Port-A-Blast," whereas the Daily News identified the machine as an "Arctic Blast." On closer inspection, the machines in the two pictures above aren't actually identical: the Montcalm County machine has a flange on the front with a darker area below it, both of which are absent from the Port-A-Blast, as you can see above. Second, the same company (Paragon) does make a model called the "Arctic Blast," seen in the picture to the right, but it also does not seem to match the Daily News photo. 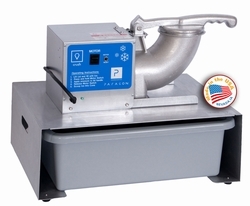 It does have the dark strip seen in that photo, but obviously the ice horn is on the wrong side, and the graphic on the grinder box is not the same. What's the explanation for this national-security dilemma? Further research revealed the likely answer: that picture shows the other side of the Arctic Blast, the side that would face away from a terrorist (or large fire) during use. The company's website did not have a full photo spread of the Arctic Blast itself, but it did have this rear view of the Port-A-Blast (left) that appears to confirm my analysis. It's not like I don't think this sh*t through, ladies and gentlemen. So it does appear that Region 6 is equipped with the higher-end Arctic Blast Treat-Maker and Strategic Ice Grinding Station, not the Port-A-Blast. But while it may be that none of us should trust "Jerrod" to go get us the exact model of ice machine we may need in a national emergency, he is still on to something. Because the Arctic Blast is also much cheaper on Amazon.com: $489.95, or just over half of what Michigan reportedly paid. (Even the list price is only $695.00.) In fact, you could get the Arctic Blast with 200 heavy-duty cups and a 10-pack of syrup and still have enough left over to buy a US PeaceKeeper Rapid Deployment Pack chock-full of ammunition. And as Jerrod points out, "[f]or an additional $79 the agency could [have] become an Amazon Prime member, giving them free shipping … and also access to free streaming movies!" This sort of blatant profiteering only helps the enemy, since the wasted money could otherwise have been used to protect ten additional counties. The lack of free streaming will also threaten our ability to gather intelligence, since not even the most hardened terrorist could resist repeated showings of "Jack and Jill." (We have to be willing to do what it takes, people.) I hope the authorities will get to the bottom of this national disgrace.